(1) What does this texture represent? (2)What is fur feel like to someone who can’t see it? (3) Can people imagine color within fabric if they can’t see it? (4) Do fabrics cause an emotional response if you can’t see them? (5) How can someone who is visually impaired differentiate between items if they feel the same? (6) Fashion in terms of self-expression to someone who is visually impaired? (7) Does smell affect the way we interact with material? (8) Details in dressing—such as buttons, zippers, etc.—how does one learn to use them? (9) How does sight affect taste? Does it? (10) How do visually impaired people interact / experience magazines? Ads? (11) How does sound impact our understanding of material? Does it? (12) What do pockets feel like to someone who can’t see them? (13) How “self explanatory” are basic fashion technologies? (14) Are there newspapers printed in braille? (15) How easy is it to adjust clothing/accessories/things if you can’t see? (17) Are toggles a useful adjuster in fashion? (18) How can one differentiate between colored pencils if one can’t see the colors? (19) How are colors imagined? (20) How accessible in the iPhone’s accessibility mode? (1) What location did you visit for your visual research and what did you find? I wanted to investigate everyday objects / materials found in homes that I felt would help me further my research on the experience of materiality (and the accessibility of some of these objects). I visited some of my friend’s places and also payed attention to the materials / objects that I interact within my home. I found some interesting materials and also began to think about, what I’ve been calling, the “technology of fashion.” This includes things like toggles, elastic, zippers, etc. I want to explore if these technologies are useful and accessible for people who are visually impaired, while also exploring materiality / fashion as self-expression / advertising and how they change when someone is visually impaired. By creating this taxonomy my ideas expanded as I am now thinking about my topic as it relates to other everyday things. For example, if someone is visually impaired, what are their other senses like? How does, or how can, this impact the way they experience their style? I new from the begging on this investigation that I wanted to also explore advertising and how I have yet to see an ad that is in braille, for instance. However, I really want to know what different materials are “feel like” and how they are imaged to further understand how to take a visual within an ad and translate it into words then braille. 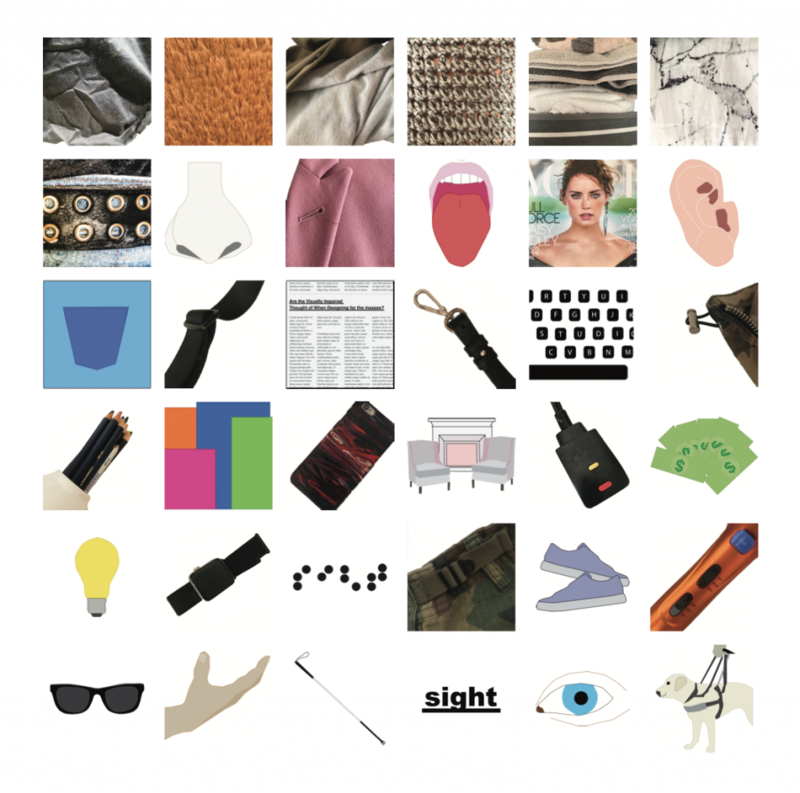 Using the everyday materials and objects I came across, I wanted to contrast them with typical methods of guidance that the blind uses, such as a seeing-eye dog. I also explored the details within fashion, because style is such and huge part of my life and I am always inspired by what it does for self-expression. Although, I’ve always been careful to think about its impacts—both negative and positive—but I’ve never thought of exploring what the experience is like for the visually impaired. 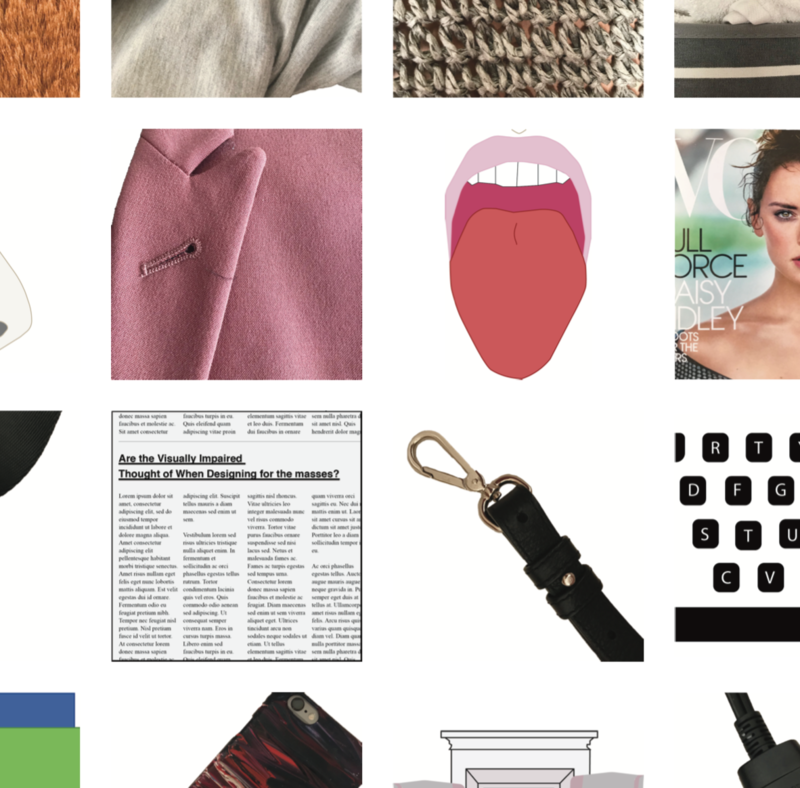 By taking the objects I included within my taxonomy, I am forcing myself to look closer at some of the practicalities of everyday fashion, materials, objects. (4) What did you learn from Monday’s peer review about your taxonomy that was new or helpful?